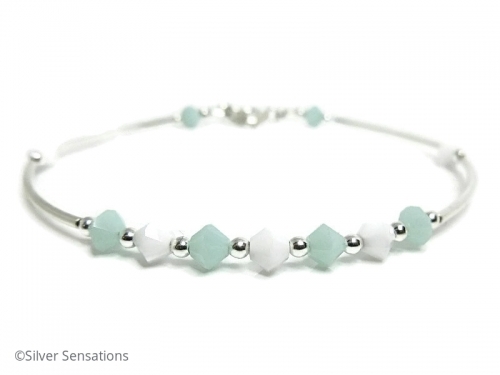 Mint green & white Swarovski Crystals are around this handmade elegant bridesmaids bangle bracelet. 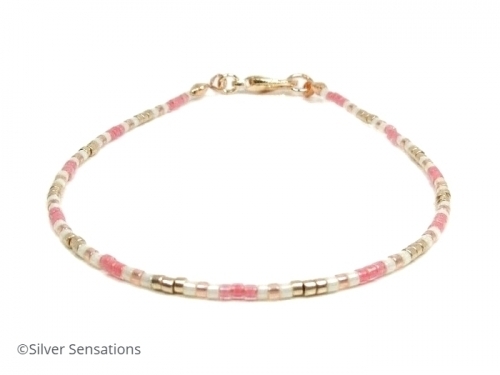 With Sterling Silver seamless curved tubes & round beads in between each station of Crystals giving this bracelet its bangle style. This stunning handmade necklace has been created with beautiful shimmering Swarovski AB Rainbow Crystals. 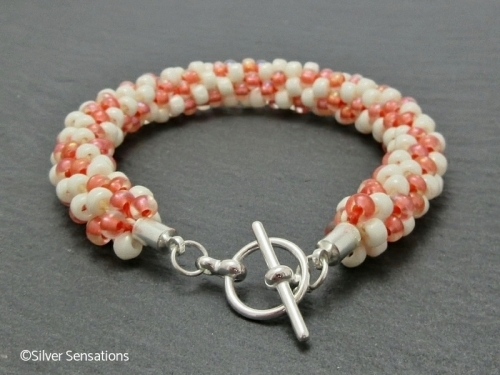 In between are Sterling Silver rombo beads & stunning wave tubes. 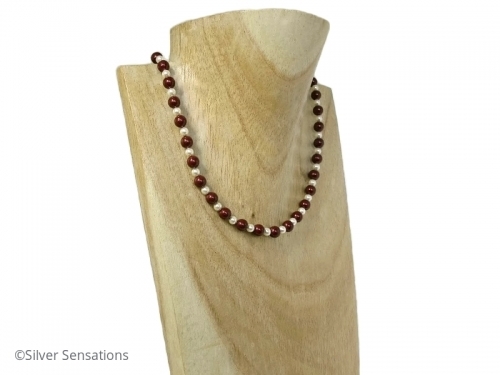 This beautiful handmade necklace features very dark burgundy red 6mm Swarovski Pearls. 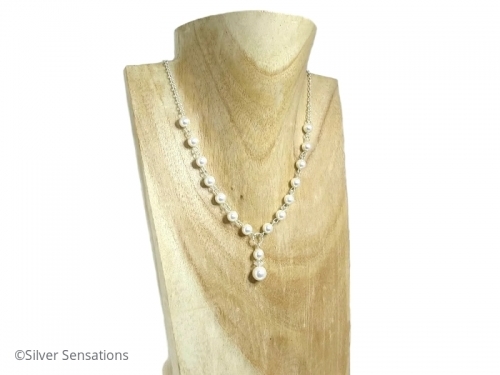 In between are small 4mm ivory cream Swarovski Pearls. 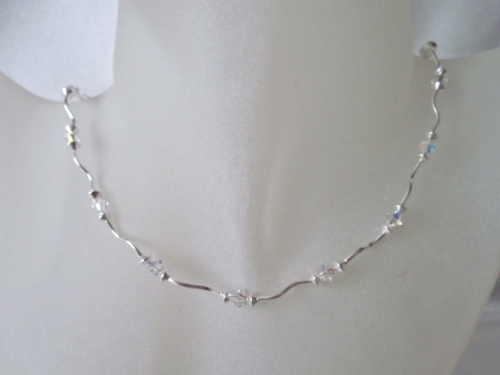 The necklace is finished with a Sterling Silver bolt ring clasp & fittings and measures 18" in length. This handmade necklace features chunky pale green Bowenite Jade 20mm coin beads with matching round beads which are 10mm in size. Also pretty Sterling Silver daisy bead caps & seamless beads..
A bespoke handmade necklace with stations of 'blocks' of White Howlite cubes which are 6mm in size with a 4mm cube at each side. 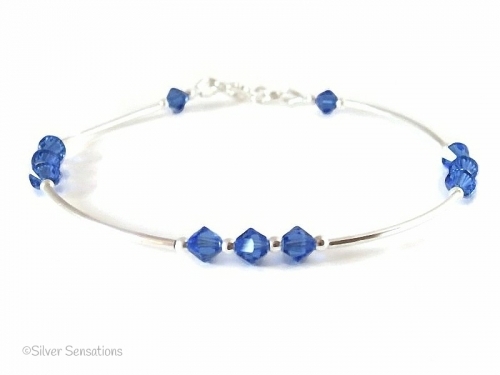 There are Sterling Silver tubes & tiny clear glass beads in between each section. 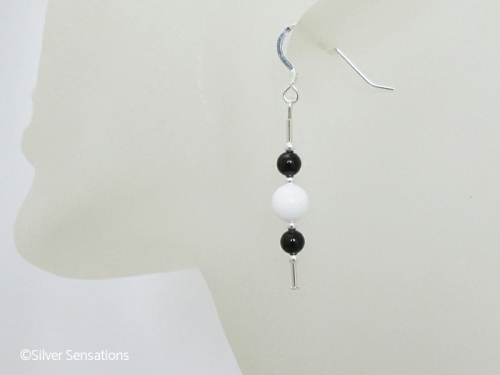 Pretty handmade black & white earrings feature 2 Onyx beads, which are 4mm in size, surrounding a larger 6mm white Snow Jade bead. 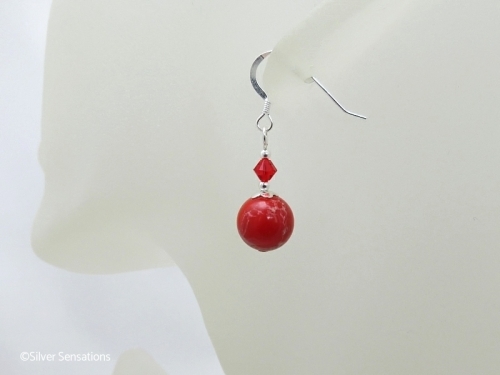 There are also Sterling Silver tubes and small seamless beads. 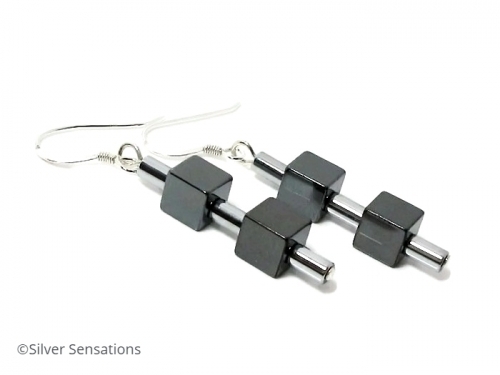 Chunky Grey Black Hematite Vase Beads & Sterling Silver Unisex Bracelet Hubby loves his bracelet. Thanks Lynne for altering it for me. So helpful. Clear Crystal Quartz Teardrops Sterling Silver Necklace Thanks for making another one for me. Two happy daughters. 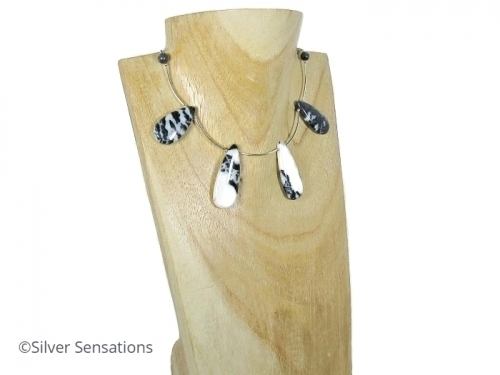 Hi Lynne, I just wanted to give you some feedback and let you know how pleased I am with the set that you made for me. It is great and goes wonderfully with the dress. 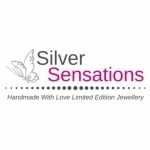 Also thank you so much for your ideas, patience and your time in sourcing the right items to make the set up, I really do appreciate your time and effort Lynne. The lovely packaging was the icing on the cake! Dear Lynne, I just wanted to drop you a quick note to say that I have received the necklace and am really pleased with the end product - it's just what I wanted. Already on wearing the necklace today I have had comments saying how nice it looks! Thank you again for going to such lengths to source the stone etc. I have no doubt that I will be in contact again in the very near future to order my next purchase (and also some presents for others)! 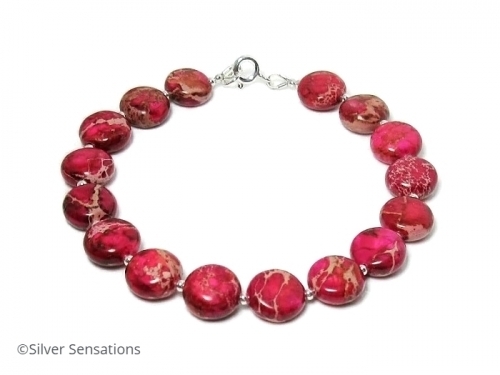 This custom necklace Lynne with Silver Sensations UK is absolutely beautiful! It is much prettier in person than the picture. It is very elegant and I just love it! I would like to recommend this vendor highly. Lynne is just super to work with and got the purchase to me right away (of course you have to give between one and two weeks to arrive since it comes from England). Dear Lynne. Every business should take a note from your book as your customer service is absolutely outstanding. I am looking forward to my gorgeous original necklace. Cant wait! :-) Today I have received the necklace in the post and I now own the entire set. I LOVE it! I am wearing it now :-) Thank you SO MUCH. It looks beautiful together.